People lived in Scotland for thousands of years before the Romans began to record Britain's history. The oldest unearthed Mesolithic hunter-gatherer encampment, discovered by archeologists near Briggar, has been dated to approximately 8500 BCE Neolithic farming techniques allowed people to make permanent settlements. 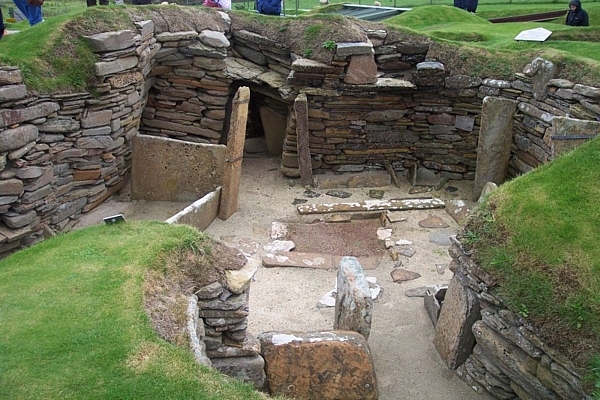 Northern Europe's best-preserved Neolithic village, Skara Brae, is composed of ten clustered stone houses set into middens. 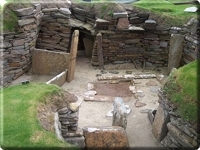 Situated on West Mainland, Orkney, the site has been dated to about 3,200 BCE. The nearby standing stones and circles, similar to other megaliths scattered all across the Highlands, offers a glimpse into religious tradition and may display a sophisticated understanding of astronomical observation. As Brythonic Celtic culture and language spread into Scotland some time after the 8th century BCE, neighbouring settlements began to make war with each other, prompting people to gather into fortified settlements. During the Iron Age, prosperous farming settlements in the Highlands were built on locations that could be easily defended from raiders. Villages grew around brochs, huge stone towers built for tribal chiefs or important farmers in the north and west. As tribes mastered iron weaponry, powerful chieftains built hillforts, or fortresses surrounded by earthen ditches, wooden palisades, or stone walls, to protect their lands. From atop his hill, the chieftain could survey the surrounding farmlands, and the farmers looked to him for protection from raiders. Hillforts became centres of trade and metalwork, giving rise to prosperous and powerful settlements.